In the main hall just outside the sanctuary is our prayer wall. It allows you to submit a prayer request or a special praise, and view requests from others that have been posted. There are also prayer/praise cards in the pew pockets in the sanctuary. In the center of the wall, there are pre-printed prayer cards to take home with those requests submitted each week on the Making Connections* cards. Prayers and praises will remain on the wall throughout the current month. *Prayer requests that are submitted on the Making Connections cards that are marked “private” will not be posted. 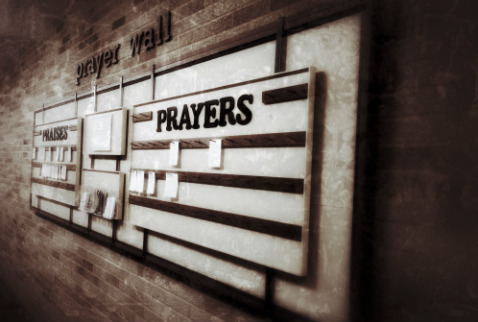 You may add your prayer request or praise reports to our prayer wall using the cards provided. If you are requesting prayer for someone else, please have their permission to do so before posting, only use their first name, and keep private details generalized in nature.